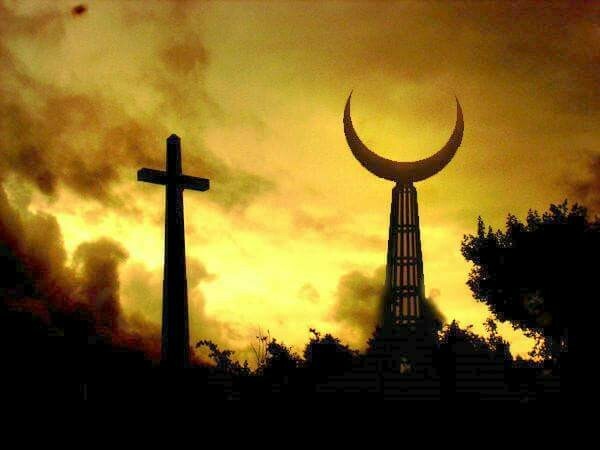 You know…both the Catholic Church and Islam started long after Jesus ascended to Heaven. Before this there were false gods, demi gods and worship of all types of creatures in different forms of religion. Funny thing is this…they essentially all represented the same “gods” or fallen angels. Each civilization and area of Earth had its own name for the same god. For example, Nimrod/Osiris/Apollo/Shiva and so on were representing the same person or in some cases the same entity (principalities and powers). Islam and Catholicism weren’t any different. The Vatican worships Roman mythological gods and well Islam, they came from a hodge podge of ancient Mesopotamian/Hindu gods. You got the Sun and the Sin worship. Now after Jesus we saw something happen. We know that the Sanhedrin hated Jesus with a passion. They even cursed their children’s, children’s generations just to put Jesus to death. Have you ever wondered why the Holocaust happened the way it did? And don’t call me anti-Semitic because there are plenty of Jews that love (and don’t love) Jesus who say that this was the reason why this happened. A curse is a curse and to curse your generations so that you could kill the Messiah, well, it’s not going to end well. We know that Constantine took Christianity and morphed it into Roman Catholicism replacing Sun worship for the Son but really it was going back to Sin. Get it? The theory goes like this. Jews infiltrated Catholicism with what are called crypto-Jews. This was to get Christians to worship false gods and idols as did Judaism. They wanted absolutely no one focused on the real Jesus. Have you ever wondered why they use the same lingo, wear the same colored garb and wear those yamakas? These infiltraters are Jews masking as “Christians”. This was their first way to counteract real Christianity with something masquerading as real Christianity. It makes a lot of sense doesn’t it? Then there is this theory. That Catholicism actually started and founded Islam using this guy Mohammad as they’re prophet. The Jews didn’t need the Arabs to get involved with this Jesus so what better way to deceive them into worshipping Kabbalah pretending its their own. This theory actually holds a lot of water. We see that Momo was married to a Catholic nun named Khadija and the man who blessed their marriage, Ibn Hišâm (Waraqa), was called a “Nazarene priest”. This man translated books from Hebrew to Arabic which even backs up the view that he was Jewish. Khadija was also allegedly the cousin of Waraqa, so she in fact had to also be a Nazarene. She was the first “convert” to Islam and this is its origin. Not only that, Momo was in fact mentioned in the Hadith’s (commentaries of the Koran) as being white. Yeah, a red headed white guy who was supposedly a Arab. Can you see the web being weaved here? 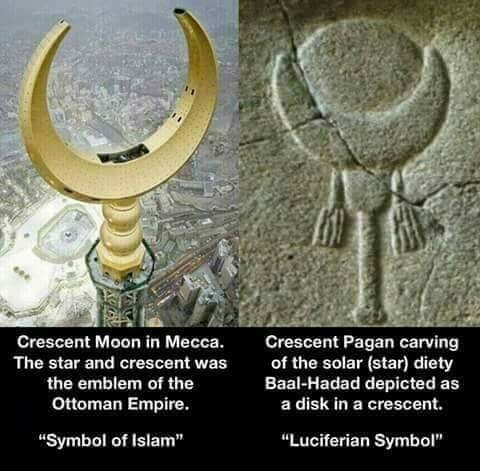 If this is true that these Catholic Jews started Islam then this would make sense as to why they both pray with beads, venerate Mary and Fatima, both worship the same god, they both hate Christians and why the book of Revelation seems to parallel Islamic eschatology. I’m leaving a lot of other parallels out that you can find yourself. This just isn’t by coincidence now is it? Oh yeah, Sharia Law (Islamic) is similar to the Noahide Laws (Babylonian Talmud Judaism). Let me also add something about the Donmeh. These were Turkish Jews in the late 1600’s that converted to Islam, not by choice, but to avoid death. They were outwardly Muslims but still practicing their Kabbalistic Judaism inwardly behind doors. This is reminiscent of these crypto-Jews. This is all planned and done to counter true Biblical Christianity and who Jesus really is. None of this is coincidence. This was just to let you know that this rabbit hole runs deep. And guess who the little sister of these two are….Chrislam. Those who say they are Jews but aren’t. PEACE WAS REACHED ACCORDING TO AL-AKHBBAR NEWS. IT’S ON MY BLOG. I did a YT video despite a horrible day. To GOD be all glory! !